Ashurbanipal (ca. 668-627 B.C.) 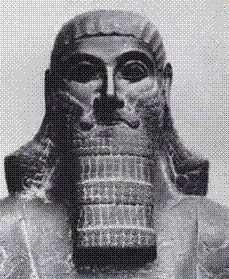 - The last powerful Assyrian king and the grandson of Sennacherib, Ashurbanipal distinguished himself from the other rulers by pursuing intellectual endeavors. His father, Esarhaddon, named Ashurbanipal heir to the thrown before leaving on a campaign to Egypt in 669 B.C.. This created a peaceful transition when Esarhaddon died en route to Egypt the following year. Thanks to the conquests of his predecessors, Ashurbanipal inherited a relatively peaceful empire. The one exception was Egypt, with which Assyria was at war. Assyria actually controlled Egypt briefly. It conquered the ancient kingdom in 670, the year before Esarhaddon left to secure his position there. However, problems were growing closer to home when the Cimmerians, Scythians and Medes to the north and to the east began asserting pressure on Mesopotamia. Egypt took advantage by declaring independence in 652, a move which went unchallenged as Assyria was unable to respond. The mighty Assyrian Empire which had cruelly enforced its dominion over its neighbors was beginning to weaken. It did not prevent Ashurbanipal from enjoying a long and successful reign, however. His greatest legacy is his library which he built at Nineveh. It was in this library that a dozen copies of the Epic of Gilgamesh were found in 1853. Despite dying of natural causes, Ashurbanipal named no clear heir before his death, and a power struggle ensued among several claimants. When it was over his son, Ashuretililani, emerged as the new king. But he was weak and his reign short. This served only to further weaken the empire...whose time was at hand.